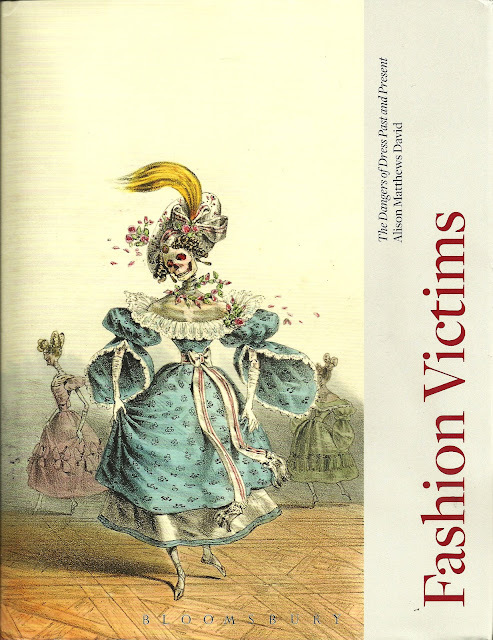 This is the second excerpt from Alison Matthews Davis” book, Fashion Victims. The first excerpt, 5/28/16, recounted the health risks posed by the long skirts worn by fashionable women. The skirts dragged on the ground, through the filthy streets of large cities and, of course, were then worn within the household, bringing with them all manner of pathogenic ( or at least, undesirable ) elements. poor example of its former self. Chemists were constantly trying to introduce new hues for the new technology of aniline dye production. Better Living Through Chemistry as one future chemical company would motto a century later. In 1778 Carl Wilhelm Scheele published his work on a green pigment he created by mixing potassium and white arsenic with a solution of copper vitriol (a sulfate of copper). Yes, you read correctly..arsenic. In 1814 a more saturated green hue was synthesized from copper acetarsenite and called by various titles. It was widely used for fabrics, children’s toys and even candies. It was also produced as a pigment in oil paints. Women were tired of the dull-colored clothing that was commonly worn and the introduction of fresh green hues was most welcome. The dye was used not only in fabric production but also in accessories such as shoes, and most widely in artificial floral wreaths of fruits and foliage worn as hair adornments and large broaches. It had been noted for some time that workers who produced the artificial foliage suffered from debilitating ulcerations on their faces arms and legs. Rashes appeared along the necklines of women wearing green gowns and there were reports of children dying from eating ( or trying to eat) artificial fruits which appeared in baskets set upon tables in Victorian parlors. Efforts were made to assuage the fears that soon were voiced by consumers. Apparently, “this is not arsenical green” became a disclaimer, but was it, or was it not? Eventually by the 1870’s, other green pigments replaced the copper arsenic compounds. Why would anyone purchase, much less wear, something that was so very dangerous? It was well known that arsenic was used as a pesticide and that it was toxic if ingested. Although there were many fallacious theories concerning disease and cures, surely, there should have been some heed paid to those physicians and chemists who warned of the danger. Thinking of today’s times, there are still those who ignore the warnings that appear on tobacco products. The question would be, is it worth being stylish?